Not yet published, price to be announced. Plus postage outside Germany. Encyclopedic in scope, yet skillfully edited to make it easy to read and understand, this trusted classic delivers everything clinicians need to know about skin, skin symptoms, and skin diseases. 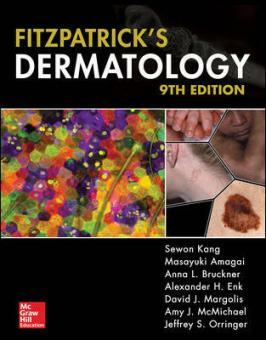 Presented in full color, Fitzpatrick’s covers all the essentials, from the basic science of skin to the day-to-day clinical issues of managing common skin disorders such as acne, skin cancer, and psoriasis. Backed by the expertise of more than 500 world-renowned contributors, and the reference of choice for clinicians, students, and educators, Fitzpatrick’s is enhanced by thousands of full-color photographs and a wealth of newly enhanced tables and diagrams. The Ninth Edition is bolstered by a new global editorial team; a reorganized table of contents; a more simple, readable, and direct writing style, the incorporation of more genetic, syndromic, and treatment information into each chapter; the addition of first, second, and third line treatment options; and improved table presentation. The reorganized table of contents reflects how disease presents rather than its cause.